Our gadgets are great, but our modern lifestyle has certainly made us more sedentary. Especially kids. You know, the ones that are always in front of a tablet screen and never going outside to play. This leads to obesity. So, you can either decrease tablet/phone time for your kids or get them some exercise. Fisher-Price wants to help keep kids fit and in shape. 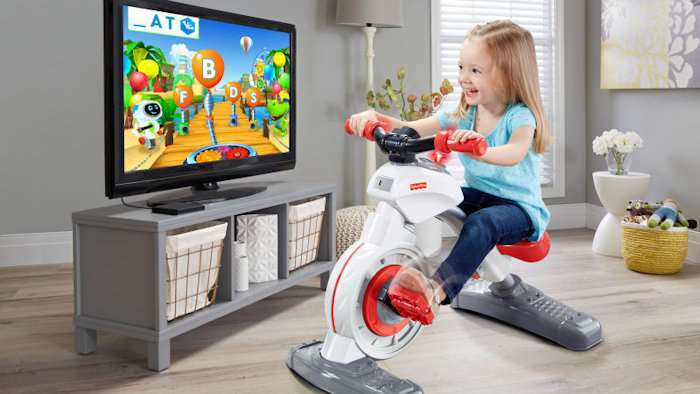 The company introduced their latest product at CES, which is basically a stationary exercise bike for preschoolers with a tablet holder. It is called the Think & Learn Smart Cycle. It is priced at $150 and serves as a ride-on video game controller, which allows kids to play with their tablets, while doing physical exercise. Used on its own, the Think & Learn Smart Cycle uses Bluetooth to connect to a tablet mounted on the handlebars. The device can also be hooked up to a larger screen, since it is Apple TV and Android TV compatible. It starts with four games, which can be downloaded from Apple’s App Store and Google Play for $5 each. The games are designed to be entertaining and educational. More apps will come in the future. We will see if this will shape kids up any.